Digital Home Thoughts: Want to Upgrade your Processor? There's an App For That! Want to Upgrade your Processor? There's an App For That! "Intel is now offering to upgrade your Core i3-2312M, Core i3-2102, or Pentium G622 processor using software. 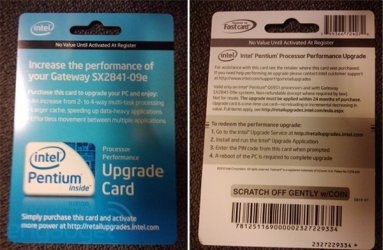 Just download a program, buy an “upgrade card” from your local supermarket, enter your magic code, and voila: a 15-20% performance boost (CPU frequency bump), and in the case of the i3-2312M you can even unlock more cache." It looks like Intel's old Intel Pentium G6951 project for software based upgrading was enough of a success that Intel is at it again. Certain low end CPUs will be locked to a more restrictive performance level in order to sell for a lower price. The practice is similar to an industry method called "binning" but with an official, hopefully warranty supported method of unleashing better power. The biggest problem I see with this system is that it only affects certain CPUs, so there could be plenty of sales which end up with a useless upgrade card. With lots of different model computers out there, purchase choices are difficult enough as it is. People more serious about hardware will easily avoid these CPUs, though some might in hopes of doing their own unauthorized upgrades. Reality probably means that this attempt at software upgrading will not pan out though.